Who was Imam Al-Bukhari, the most famous Muslim to document Islamic hadiths? Imam Mohammed Al-Bukhari is considered as one of the most distinguished scholars of Hadith in Islamic history. His book Sahih al-Bukhari, in which the Prophet's words, actions, or habits were collected, is one of the greatest sources of the prophetic influence in history. 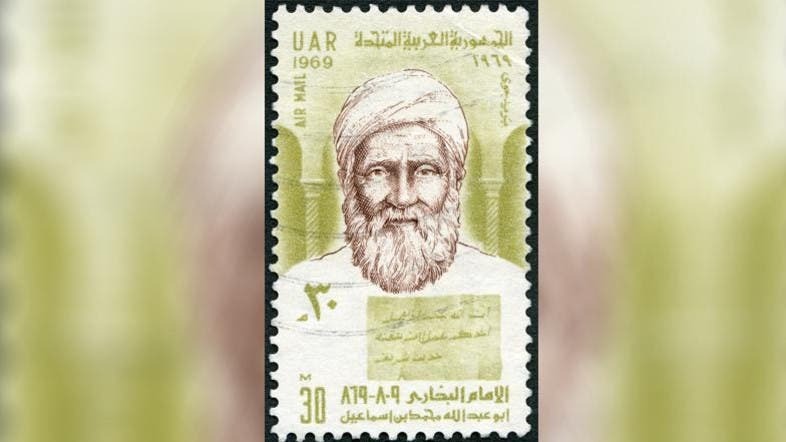 His full name is Abu Abdullah Mohamed bin Ismail Al-Bukhari and was born in 194 AH (8100 AD) in Bukhara, one of the present cities of Uzbekistan. His father died when he was young, and he was raised as an orphan by his mother, who educated him well and had a role in sharpening his love and passion for science. As a child, he had a disease in his eyes which led to fears of losing his eyesight, but he was cured. He was highly intelligent as a child and had strong memory, one of the qualities that helped him later in the collection of the Prophet's words and actions (Ahadiths). During his youth he memorized the Holy Quran and learned the basics of religion. He had memorized thousands of Ahadiths while he was still a young boy. Bukhara's atmosphere, which was then one of the centers of science, also helped him. He attended the meetings with scientists and religious scholars frequently. At the age of 16, he traveled with his mother and brother Ahmed to Mevva to perform the Hajj pilgrimage and stayed there to gain more knowledge. He would go on to stay in the holy city for six years and began to collect ahadiths. Sahih al-Bukhari is one of the Kutub al-Sittah (six major hadith collections) of Sunni Islam. Then, he traveled to many countries for the same reason, from Baghdad to Kufa, Damascus, Egypt, Khorasan and others, studying tirelessly and striving to collect more ahadiths. It was said that he did not write any of them until he has done wudu (Islamic procedure for washing parts of the body, a type of ritual purification) and praying two rak'ahs (single unit of Islamic prayers). His followed a strict method in Hadith, inquiring of the narrators and references, he became a symbol in this section in the good classification and scrutiny. 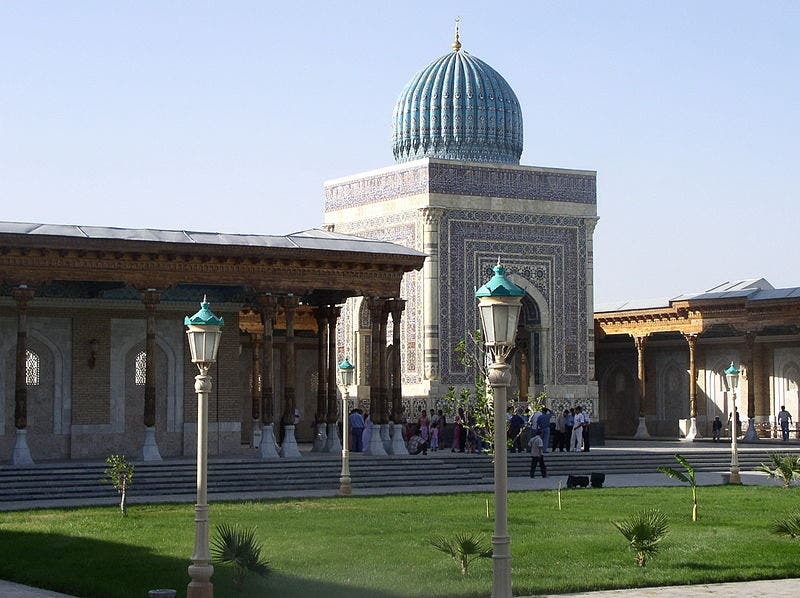 The tomb of Imam Bukhari in Samarkand, Uzbekistan. In addition to the basic reference "Sahih al-Bukhari" of the ahadiths, he classified more than twenty books, including “the odd-literature “and “the great history”, which is a book of translations where the names of the modern narrators arranged by the letters of the lexicon, and “the small history”, a brief history of the Prophet and his companions and narrators that came after them. The story of his authorship of “Al-Jama'ah al-Sahih” or “Sahih al-Bukhari”, which is the first classified book in the correct abstract and considered as a proof of eagerness, sincerity and intelligence. It took 166 years of tough trips between countries. As for the trigger of the idea, Bukhari mentioned it himself, saying: "I was with Ishaq Ibn Rahawi, when he said: If you collected a brief book about the correct norms of Prophet Mohamed the Messenger of Allah (peace be upon him). So I like the idea and started to collect “Al-Jama'ah Al Sahih” Ibn Rahawi was one of the teachers and professors of Al-Bukhari, one of the scholars of Nishapur. He did not rush out to publish the book and made a lot of reviews, revisions and investigations until he came out with the final version to include 7,275 Hadiths selected by Bukhari out the 600,000 that he received, where he worked hard on checking the narrations in a strict manner. He set conditions to accept the story of the narrator of the hadith, which is to be contemporary to those who narrated it, and to have heard the talk out of the person himself, in addition to: trust, justice, discipline, mastery, science and honesty.